The first book in a planned trilogy, The Nameless City (First Second Books) marks a new period in author Faith Erin Hicks’ career, and here she leans into the fantasy and young adult milieu that had, until now, merely flavored her work. Situated in a pre-industrialized world inspired in equal parts by Avatar: The Last Airbender and classical Chinese aesthetics, the book’s plot recalls staples of preteen bookshelves like City Of Ember, The Giver, and a dozen others. 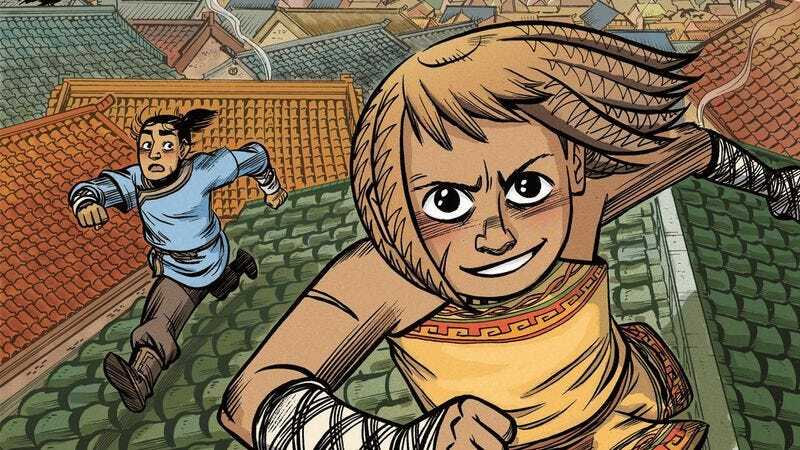 The Nameless City is a story of friendship amid political turmoil, and it focuses almost exclusively on the budding friendship between Kaidu and Rat, two young kids who meet in the titular nameless city and seek to transcend the colonialism and racism of their society. This relationship is the central component of the book, and it binds the plot together. With it, Hicks emulates one of the hallmarks of Hayao Miyazaki’s oeuvre; namely, the platonic friendships between young boys and young girls. The relationship, however, creates friction in the characters’ racist society, and this friction drives the plot. The bulk of the book is devoted to Rat and Kaidu (often abridged as “Kai”) endearing themselves to one another. Rat, helping him acclimate to the city, teaches Kai how to run across the great plains of homogenous buildings that populate the city—tiled roofs, multi-inclined buildings, and Dougong buttresses—and Hicks emphasizes the physicality of that bonding. The repetitious running and jumping provides her ample opportunity to showcase elements of her cartooning that have remained more sedate in her other work, and she demonstrates a captivating sense of movement and speed. Hicks, however, grasps a double-edged sword, and colorist Jordie Bellaire’s rich palette both makes the book more appealing to a younger audience and obscures Hicks’ energetic inks. Much of Beverly (Drawn & Quarterly) is legitimately distressing. As a cartoonist, Nick Drnaso is fixated on the disgusting: not necessarily the physically grotesque (although there is a fair amount of that here), but emotionally and psychologically repellant aspects of modern living. Drnaso’s characters slouch through lives of such petty tragedy that they don’t even register on the same scale as Thoreau’s “quiet desperation.” The characters squirm and the reader squirms along with them. It’s not a fun book to read. As a craftsman Drnaso is confident and controlled. His pages strongly resemble Chris Ware, whose precisely mechanical compositions are mirrored in Drnaso’s meticulously crafted panels. The Ware influence is obvious in both style and tone—obvious enough that D&Q may have erred by placing a jacket quote from Ware on the book’s back cover. Drnaso’s attention to architectural detail, as well as his eminently tasteful palette of soft pastels—a consistent aesthetic that echoes the putrid low-level nausea associated with rows of thousands of ranch houses lined up in perfectly parallel halogen bulb lockstep—more than “brings to mind” Ware’s own work. It’s a sufficiently striking resemblance that the older artist’s imprimatur seems almost masturbatory. Or perhaps the fulsome praise was the only way to lampshade such an obvious critique. None of this would be a problem if Drnaso offered something new with the familiar materials on hand. But unfortunately, in 2016, there is no shortage of comics work by disaffected young white men who see the world as an unending parade of disappointment and revulsion. Nor is there any shortage of immaculately crafted, technically proficient graphic novels that ultimately fall short of lofty ambition. Drawing average people as compulsively unattractive has been done. The ennui of disaffected white high school kids has been done by Dan Clowes, by Noah Van Sciver, by Ariel Schrag, by Adrian Tomine. Hell, the portrait-of-a-young-sociopath has been done, definitively, by Derf Backderf. Even Drnaso’s (admittedly very well executed) breast cancer self-check instructional comics pamphlet aesthetic has already been perfected, by Chris Onstad in Achewood. It’s easy to screw up stories about high school. Too many writers forget the day to day dullness of it, the soup of hormones and petty drama that caused irregular spikes in activity. Too many writers forget how smart young people are, and how much smarter than that they think they are. Basement Dwellers (webcomic) by Leland Goodman doesn’t succumb to any of the worst traps when it comes to reliving the heady and achy days of teenage angst, instead portraying an honest account of what high school really feels like for a lot of people; particularly those, to quote Goodman, who “felt like an idiot” there. Goodman, who both writes and draws Basement Dwellers, has created a cast of characters at once intensely unique and universal. Main character Zoe is a fairly androgynous young woman, smart and clever but deeply unmotivated by anything that isn’t her guitar or music. She’s black, she plays left-handed, and her favorite band is Rotblood, but despite all of the specificity of who she is and what she loves, her experience is broad enough that it will resonate with nearly everyone. Zoe deals with the disappointment of both teachers and parents, the casual racism of teenagers, an errant crush, the claustrophobic press of siblings, and feeling increasingly isolated from the people she wants to be able to count on. It’s a beautiful, intimate reminder of how confusing and upsetting being that young can be, when you want to have control over your life but barely have control over your body. The art on every page is remarkably crisp. Goodman experiments with perspective and angles in a way that lots of other artists don’t, and she’s got an incredible handle on what color can do for the feeling of a panel. The publishing schedule has been erratic in the past, but Goodman’s art is absolutely worth the wait and the comic binge-reads well. Character expressions, especially when Zoe is interacting with her little brother or laughing at something her friend has said, are particularly well executed. Goodman has a knack for body language, allowing her to keep most of the pages light on dialogue where a weaker artist might rely too much on words to get their point across. Science fiction has experienced a huge boom in comics over the last couple years, and readers looking for stories of dystopian futures, alien worlds, and biological/technological evolution have a huge array of options from publishers like Dark Horse, IDW, Image, and Boom! Studios. It’s easy for new sci-fi titles to get lost in the shuffle, but Paknadel & Trakhanov’s Turncoat #1 (Boom!) demands attention thanks to the extraordinary artwork of Artyom Trakhanov and colorist Jason Wordie, bringing Alex Paknadel’s genre-bending script to the page with bold style and dynamic energy. The story of a private detective, Marta Gonzalez, living in New York City five years after the end of a 300-year alien occupation, Turncoat incorporates elements of crime noir into its sci-fi narrative, offering a hardboiled street-level view of a city mutated by extraterrestrial influence. Paknadel has a lot of background information to cover before he gets to the meat of the plot, and while there are some clunky bits of exposition at the start, particularly the explanation of Marta’s specific situation in this new status quo, the world building gets smoother as the issue continues. It helps that he’s working with an artist with a talent for creating richly detailed, lived in environments, allowing Paknadel to focus on character while the art team handles the atmosphere. A police officer that worked for the alien Management before switching allegiances to help the human resistance attack their oppressors, Marta Gonzalez now lives as an outsider, shunned by Management supporters for her betrayal and rejected by her fellow rebels for her history before the change of heart. In classic noir detective fashion, Marta has found a way to piss off everyone around her, and Paknadel uses this to keep the tension high throughout this first issue. It’s a dense introduction to Marta and her world, but there’s a strong forward motion in the script that keeps the story moving at a brisk pace, beginning with the opening page depicting Marta’s big heroic moment against the Management in a single rapid-fire nine-panel grid. The creative team makes some interesting choices in that first page, offering a chaotic sequence of close-up snapshots of the action that keeps the scale small despite the huge implications of the event. Wordie also limits his palette to shades of the primary colors, giving the page a visual intensity that is dulled when the narrative jumps to Marta after the attack, resulting in more varied, textured coloring. The scope of Trakhanov’s artwork gradually expands outward in this opening sequence, building to a striking full-page spread of the Management departing New York City, a dramatic visual that accentuates just how big this moment is for the entire planet.